A clean table for two please. Oh, and hold the cockroaches. That's not a request usually spoken by restaurant goers because those who dine out have basic (sometimes subconscious) expectations of places where they eat: A clean kitchen, good hygiene and carefully prepared food. Yet in the heart of Silicon Valley, Santa Clara County’s Health Department has no system that scores restaurants, so customers walking in the door don't know just how restaurants fared in those categories. The NBC Bay Area Investigative Unit found information-hungry consumers can explore violations on the county website, but that information is vague and confusing, leaving only one way to get meaningful information on a restaurant’s inspection history: Make an appointment to view the file. In the Bay Area, counties including San Francisco, Alameda and San Mateo have all passed ordinances mandating some form of scoring system for restaurant inspections and the posting of that score, so diners can make informed decisions. While restaurants from Los Gatos to Palo Alto do not have scores or grades in their windows, they do have to follow the state of California Retail Food Code, which says a copy of the latest inspection must be available upon request. So NBC Bay Area tested the system with undercover cameras, visiting 10 restaurants in Santa Clara County and asking to review the report before eating to see who was willing to share. Nine out of ten restaurants denied the request. “We don’t share our inspection report with customers,” he added. Another that could not provide the report is Yummy Buffet on Capitol Expressway in South San Jose, where an employee spent several minutes looking through a file cabinet, but then told the undercover producer he could not locate the document. “If you don’t trust people, just cook yourself, right? Better to go home and cook yourself,” he said. NBC Bay Area reached out to the restaurants named in this report and all said they will educate their employees on the law. Denny’s also said it is issuing a reminder to each of its restaurants in California. “It absolutely is not acceptable,” Heather Forshey, director of the Consumer Protection Division at SCC’s Department of Environmental Health said after viewing NBC Bay Area’s undercover video. “If it is a widespread problem we will definitely remind our staff as a regular practice to remind the operators that they are required to show a copy of the most recent inspection report,” Forshey said. While the thought of critters crawling near food is quite the appetite killer, our undercover cameras also showed restaurant employees giving false information about recent inspections. Since nothing is required to be posted, customers wouldn’t know any better, but the Investigative Unit filed public records requests and reviewed dozens of inspection files at the county office prior to going undercover. An NBC Bay Area producer asked an employee at Kobe Japanese Restaurant in Santa Clara if it had ever been shut down. “No, not in 25 years,” the employee said. The latest inspection report shows Yummy Buffet had 16 violations, also with a history of bugs. “Have you ever been shut down?” NBC Bay Area’s undercover reporter asked. “No,” he said, shaking his head. Yet the file of inspection reports reveals the location was shut down at the end of 2011 for a “large amount of roaches” and last summer inspectors found more roaches at the restaurant. “I am disappointed that the restaurants are not providing you with truthful information or any member of the public,” Forshey said. Forshey emphasized the importance of the public knowing what happens behind the kitchen doors, but that consumers should take initiative to check reports online. “I think they should want to take a look at any restaurant they are unfamiliar with,” she continued. NBC Bay Area found that even if customers go to the trouble of exploring inspection reports on the county website, the information presented is unclear. It lists the date of the latest inspections for the facility, and provides generic code violations but does not give specifics about what the inspector found or if they were fixed. The Investigative Unit found citations listed for each establishment such as “Major: No rodents, insects, birds, or animals” but the exact violation or significance is not defined, allowing the information to be misleading. The county website also does not specify when a restaurant is shut down. NBC Bay Area found one fast food chain in San Jose with the words “Enforcement Action” next to it on the county website, but no explanation. The Investigative Unit showed it to Forshey. “How are customers supposed to know what this means if you don’t know what this means?” Investigative Reporter, Jenna Susko, asked. “Do you see why I’m having trouble looking at this, how someone at home could have trouble understanding what that means?” Susko asked. “Yes I agree that there are improvements that could be made in this system,” Forshey acknowledged. 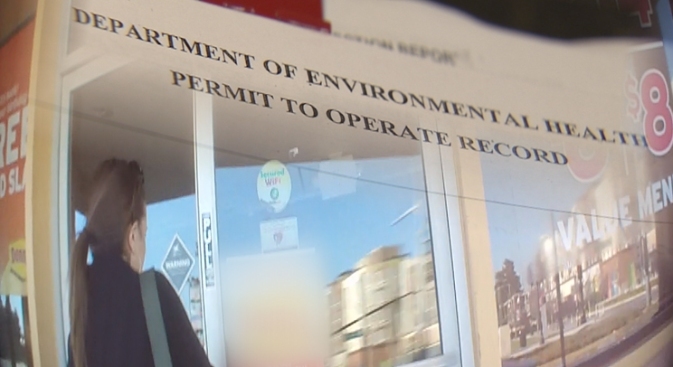 After the interview, Forshey emailed NBC Bay Area, saying that all inspectors are reminding restaurants they are required to show inspection reports upon request of customers. “I think Santa Clara County could do more to help people understand what that information means,” Phillip Leslie, a business professor at UCLA’s MBA program told NBC Bay Area. Leslie conducted a study in 2003 in Los Angeles in which he found hospitalizations from food-borne illness dropped 28 percent in the three years after the city instituted its letter grading system for restaurants. His study also found restaurants with A or B grade had increased revenues. Leslie says having the information in the window incentivizes restaurants to stay clean and allows customers to make an educated choice of where to eat. “Even if all restaurants did have the information on hand at the restaurant itself, people are still not going to ask for it. That’s an awkward moment in a restaurant, you don’t want to start out that way,” he said.